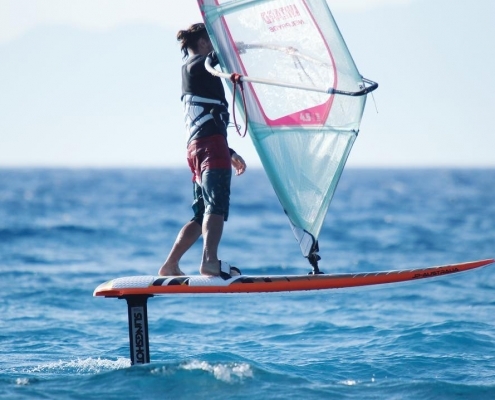 Wind foiling has taken the world of windsurfing by storm and is offering a whole new dimension to the sport. Full speed planing is now possible with smaller sails in only 7-10 knots of wind taking light wind windsurfing to a whole new level! At Surfers Paradise we got our first wind foil in 2016 and have since then grown our fleet to different models and sizes. Are you also tempted to try? Book our wind foil introduction course where we go through the first steps! Plan your windsurfing holiday ahead, pay less than on spot and make sure there is availability.